Piksters - Piksterstm remove plaque & food particles in areas normal toothbrushes don't reach as effectively. Strong, stiff wire for less buckling. New! for cleaning between teeth removes plaque & food particles strong, stiff wire means less buckling high quality Plastic Handle Covers for the Bristles 8 Sizes Available Size 1 Purple Handle in this package 40 Pack Also available in 10 pack Why Use PikstersTM? PikstersTM bristles reach into and clean the indents on the surfaces between your teeth- especially at the gum line of molars and premolars. Plaque is a significant factor in decay and gum disease. Decaying food particles also cause bad breath. Floss is not as effective in this situation, although it is very effective in other areas and should be used in conjunction. Plastic handle covers for bristles. High quality & removes plaque. Piksters - Decaying food particles also cause bad breath. Note to dentists: Color of handles follows same size sequence as endodontic files. Plastic handle covers for bristles. Floss is not as effective in this situation, although it is very effective in other areas and should be used in conjunction. Piksters remove plaque & food particles in areas normal toothbrushes don't reach as effectively. Strong, stiff wire for less buckling. New! for cleaning between teeth removes plaque & food particles strong, stiff wire means less buckling high Quality Plastic Handle Covers for the Bristles 8 Sizes Available Size 1 Purple Handle in this package 40 Pack Also available in 10 pack Why Use Piksters? Piksters bristles reach into and clean the indents on the surfaces between your teeth- especially at the gum line of molars and premolars. Piksters Interdental Brushes, Size 3 40 ea - Plaque is a significant factor in decay and gum disease. High quality & removes plaque. Piksters / Erskine Oral Care PIK404 - Deliver superior cleaning ability. The case is resealable and perfect for travelling or your bag. Stronger, brushes last longer. Due to the smart design of the slim compact handle, allows the user to rotate the brush on insertion, this results in less plastic per item = less overall waste. Size 4 is part of the Piksters Connect System. The slim compact handle allows the user to rotate the brush on insertion, resulting in an easy efficient cleaning action. Interdental brushes are like mini toothbrushes that get into the tiny spaces between teeth and clean effectively right down to the gum line. Quality nylon bristles compress on insertion and spring open on withdrawal, Plastic Coated Wire. Piksters Interdental Brushes 40 Pack, Size 4 Red - The cap also allows brush to dry between uses and keeps bristles clean. Slim ergonomic compact handle, resulting in less pressure being placed on the tip of the brush. Extra durable pa612 bristles deliver superior cleaning ability, the quality nylon bristles compress on insertion and spring open on withdrawal. Piksters last longer, are better quality and offer better value significantly less expensive per brush than many other brands. Strong, stiff wire for less buckling. They are excellent for around the back teeth because they can get into areas your toothbrush and floss cannot reach. Every brush has a cap which acts as a handle extension. Piksters / Erskine Oral Care PK640 - Size 6 green in a convenient 40 pack. Quality nylon bristles compress on insertion and spring open on withdrawal, Stiffer, cleaning furcations even better than floss. Connector cap can be used as an extension handle for easier use, or can be used to connect two different sized Piksters together for easier use. Interdental brushes are like mini toothbrushes that get into the tiny spaces between teeth and clean effectively right down to the gum line. Small convenient plastic case holds 40 brushes. The case is resealable and perfect for travelling or your bag. Stronger, brushes last longer. Resulting in less bending of the wire. Piksters Interdental Brushes 40 Pack, Size 6 Green - Due to the smart design of the slim compact handle, allows the user to rotate the brush on insertion, this results in less plastic per item = less overall waste. Size 4 is part of the Piksters Connect System. Piksters interdental brushes. Strong, stiff wire for less buckling. Small convenient plastic case holds 40 brushes. Extra durable pa612 bristles. Results in the wire resisting buckling, Stiffer, cleaning furcations even better than floss. Piksters / Erskine Oral Care PK140 - Small convenient plastic case holds 40 brushes. They are excellent for around the back teeth because they can get into areas your toothbrush and floss cannot reach. Deliver superior cleaning ability. Resulting in less bending of the wire. Quality nylon bristles compress on insertion and spring open on withdrawal, Plastic Coated Wire. Small convenient plastic case holds 40 brushes. Piksters are australia's no 1 interdental brush and are made of stronger, stiffer wire which resists buckling and bending. The cap also allows brush to dry between uses and keeps bristles clean. Slim ergonomic compact handle, resulting in less pressure being placed on the tip of the brush. Piksters Interdental Brushes 40 Pack, Size 1 Purple - Deliver superior cleaning ability. Interdental brushes are like mini toothbrushes that get into the tiny spaces between teeth and clean effectively right down to the gum line. The cap also allows brush to dry between uses and keeps bristles clean. Slim ergonomic compact handle, allows the user to rotate the brush on insertion, resulting in less pressure being placed on the tip of the brush. High quality & removes plaque. The slim compact handle allows the user to rotate the brush on insertion, resulting in an easy efficient cleaning action. Small convenient plastic case holds 40 brushes. Piksters / Erskine Oral Care PIK405 - The case is resealable and perfect for travelling or your bag. Perfect for cleaning in between tight spaces especially for those with stripped incisors or tight contacts between their teeth. Suitable for daily at-home maintenance for healthy teeth and gums. Piksters are australia's no 1 interdental brush and are made of stronger, stiffer wire which resists buckling and bending. Small convenient plastic case holds 40 brushes. Small convenient plastic case holds 40 brushes. The case is resealable and perfect for travelling or your bag. Perfect for cleaning in between tight spaces especially for those with stripped incisors or tight contacts between their teeth. Suitable for daily at-home maintenance for healthy teeth and gums. Piksters Interdental Brushes 40 Pack, Size 5 Blue - Small convenient plastic case holds 40 brushes. The slim compact handle allows the user to rotate the brush on insertion, resulting in an easy efficient cleaning action. They are excellent for around the back teeth because they can get into areas your toothbrush and floss cannot reach. Results in the wire resisting buckling, brushes last longer. Size 00 is also great for treating gum conditions below the gum line. Connector cap can be used as an extention handle for easier use, or can be used to connect two different sized Piksters together for easier use. Piksters / Erskine Oral Care PIK403 - Size 4 redin a convenient 40 pack. Resulting in less bending of the wire. Results in the wire resisting buckling, Stiffer, cleaning furcations even better than floss. Connector cap can be used as an extension handle for easier use, or can be used to connect two different sized Piksters together for easier use. Resulting in less bending of the wire. Due to the smart design of the slim compact handle, this results in less plastic per item = less overall waste. Size 6 is part of the Piksters Connect System. Piksters interdental brushes. Ultra fine size 00 Bright Pink in a convenient 40 pack. Size 00 is also great for treating gum conditions below the gum line. Piksters Interdental Brushes 40 Pack, Size 3 Yellow - Connector cap can be used as an extention handle for easier use, or can be used to connect two different sized Piksters together for easier use. Size 00 is part of the Piksters Connect System. Piksters interdental brushes. Results in the wire resisting buckling, brushes last longer. The slim compact handle allows the user to rotate the brush on insertion, resulting in an easy efficient cleaning action. Due to the smart design of the slim compact handle, allows the user to rotate the brush on insertion, this results in less plastic per item = less overall waste. Size 3 is part of the Piksters Connect System. Piksters / Erskine Oral Care PIK407 - The case is resealable and perfect for travelling or your bag. Stronger, plastic coated wire. Small convenient plastic case holds 40 brushes. Small convenient plastic case holds 40 brushes. The case is resealable and perfect for travelling or your bag. Stronger, plastic coated wire. Size 00 is also great for treating gum conditions below the gum line. Connector cap can be used as an extention handle for easier use, or can be used to connect two different sized Piksters together for easier use. Size 00 is part of the Piksters Connect System. Piksters interdental brushes. Extra durable PA612 Bristles. Piksters interdental brushes. Small convenient plastic case holds 40 brushes. Piksters Interdental Brushes 40 Pack, Size 7 Black - Quality nylon bristles compress on insertion and spring open on withdrawal, Stiffer, cleaning furcations even better than floss. Connector cap can be used as an extension handle for easier use, or can be used to connect two different sized Piksters together for easier use. Plastic handle covers for bristles. Extra durable pa612 bristles. A great value; high quality brush offered in 9 different sizes at 1/2 the price of the leading brands. Piksters / Erskine Oral Care PIK400 - Quality nylon bristles compress on insertion and spring open on withdrawal, Stiffer, cleaning furcations even better than floss. Connector cap can be used as an extension handle for easier use, or can be used to connect two different sized Piksters together for easier use. Extra durable pa612 bristles. Size 3 yellow in a convenient 40 pack. The case is resealable and perfect for travelling or your bag. Perfect for cleaning in between tight spaces especially for those with stripped incisors or tight contacts between their teeth. Suitable for daily at-home maintenance for healthy teeth and gums. Small convenient plastic case holds 40 brushes. The cap also allows brush to dry between uses and keeps bristles clean. Piksters Interdental Brushes 40 Pack, Size 0 Grey - Slim ergonomic compact handle, resulting in less pressure being placed on the tip of the brush. Due to the smart design of the slim compact handle, this results in less plastic per item = less overall waste. Size 6 is part of the Piksters Connect System. Piksters interdental brushes. Ultra fine size 00 Bright Pink in a convenient 40 pack. Strong stiff wire high quality. - The case is resealable and perfect for travelling or your bag. Stronger, plastic coated wire. Size 00 is also great for treating gum conditions below the gum line. Connector cap can be used as an extention handle for easier use, or can be used to connect two different sized Piksters together for easier use. Size 00 is part of the Piksters Connect System. Small convenient plastic case holds 40 brushes. Strong stiff wire high quality. Quality nylon bristles compress on insertion and spring open on withdrawal, Stiffer, cleaning furcations even better than floss. Connector cap can be used as an extension handle for easier use, or can be used to connect two different sized Piksters together for easier use. 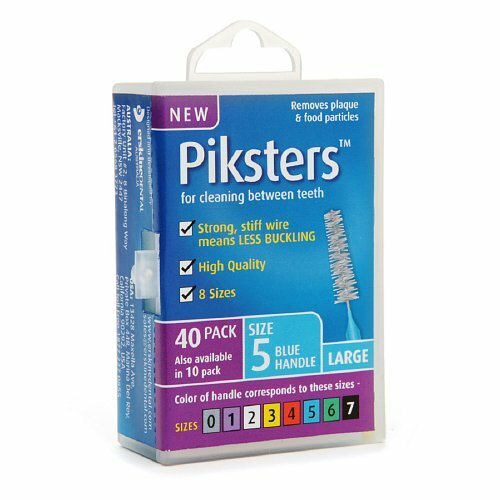 PIKSTERS for cleaning between teeth Size 7 Black 40Pk by PIKSTERS - Size 4 redin a convenient 40 pack. The case is resealable and perfect for travelling or your bag. Perfect for cleaning in between tight spaces especially for those with stripped incisors or tight contacts between their teeth. Suitable for daily at-home maintenance for healthy teeth and gums. Resulting in less bending of the wire. Deliver superior cleaning ability. The case is resealable and perfect for travelling or your bag. Piksters / Erskine Oral Care PIK402 - The case is resealable and perfect for travelling or your bag. Stronger, plastic coated wire. High quality & removes plaque. Piksters interdental brushes. Due to the smart design of the slim compact handle, allows the user to rotate the brush on insertion, this results in less plastic per item = less overall waste. Size 3 is part of the Piksters Connect System. Piksters size 7. Made in Indonesia erskinedental. Com strong, stiff wire for less buckling. Due to the smart design of the slim compact handle, allows the user to rotate the brush on insertion, this results in less plastic per item = less overall waste. Size 4 is part of the Piksters Connect System. Piksters Interdental Brushes 40 Pack, Size 2 White - Piksters interdental brushes. The cap also allows brush to dry between uses and keeps bristles clean. Slim ergonomic compact handle, resulting in less pressure being placed on the tip of the brush. Results in the wire resisting buckling, Stiffer, cleaning furcations even better than floss. Connector cap can be used as an extension handle for easier use, or can be used to connect two different sized Piksters together for easier use.